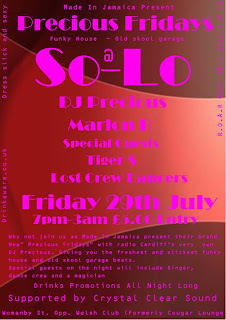 YOU have been invited to come and CELEBRATE LIFE at the Launch of PRECIOUS FRIDAYS @ SO:LO the new, exclusive place to be in Cardiff town!!! LIVE PA .... TIGER S...performing " KILLING TIME " the summer hit Produced by Aphrodisiax. Come with a POSITIVE vibe to hear good MUSIC with HAPPY people just polish off your DANCING shoes, wear a SMILE and the rest my FRIEND will be HISTORY!! !